As discussed in Part 1: Constitutional Court and constitutional amendment, the Constitutional Court and independent agencies have played crucial roles in Thailand’s protracted political conflict between the old establishment and the new anti-establishment forces. Often aligned with the traditional elite, the independent agencies are widely seen as the “guardians” of Thai democracy. They are expected to be impartial in providing checks and balances against corrupt politicians and civil servants. Part 2 shows how the notion of “impartial guardians” may be more a wishful thinking than a reality, as independent agencies have proven to be less than impartial on numerous occasions. Question have been raised as well about the extent to which they have been exploited as political tools in the ongoing political conflict. The Constitutional Court and independent agencies in Thailand, including the Election Commission (EC), the Ombudsman, the Office of the Auditor General (OAG), the National Anti-Corruption Commission (NACC) and the National Human Rights Commission (NHRC), were mostly created by the 1997 Constitution of Thailand. They are constitutionally mandated organs that function outside the Cabinet Ministries. Apart from its respective constitutional requirements, each independent agency is governed by statue and regulations and governed by a committee of officials appointed by representatives of Parliament and the courts. Following the 2006 coup, the 2007 Constitution strengthened the power of these so-called guardians, while curbing powers of elected politicians by turning the Senate from a fully elected body into a half-elected one. The Constitution requires half of the Senate (74 out of 150 members) to be appointed by independent agencies and the courts. One way to gauge the “independence” of the independent agencies is by looking at how the individuals appointed to these bodies are appointed, and how the appointment protocol interfaces with the democratic system of governance. 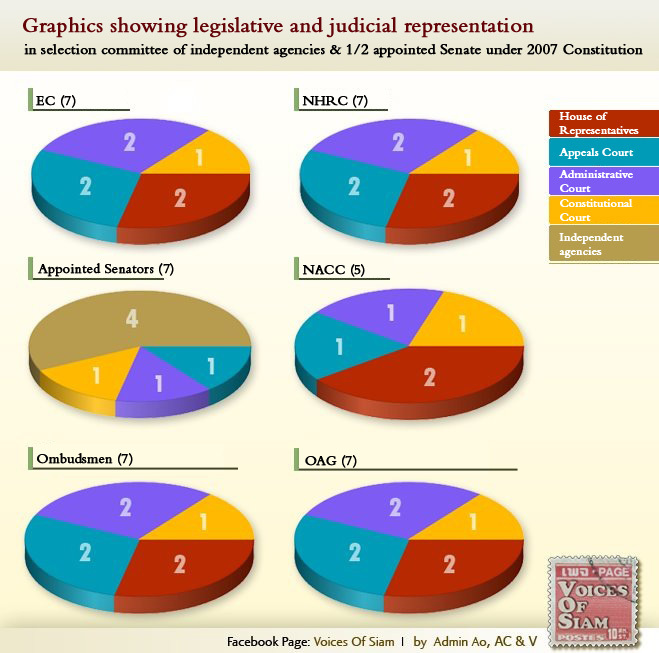 The chart below shows the legislative and judicial representation of the committee that appoints members of each independent agency and half of the Senate. (The numbers are representatives from each category. For instance, the selection committee for each independent agency has two representatives from the House of Representatives with the rest from various courts, and half of the Senate is appointed by a selection committee which comprises seven members, including chiefs of the EC, Ombudsman, OAG, NACC, Constitutional Court, Appeals Court, and Supreme Court). The strengthening of unelected powers in the 2007 Constitution was conceived as a measure to prevent an overwhelming majority in Parliament from having absolute control over the governing process as happened during the Thaksin regime. The majority of Thaksin’s Thai Rak Thai government was so hugely decisive that it rendered the opposition practically powerless. So it was feared and loathed by opponents who often describe it as “parliamentary authoritarianism” or “tyranny of the majority.” While the concerns over the excessive “CEO-style” management and disregard for the law were legitimate during Thaksin’s administration, it seems, however, that any decisive parliamentary decisions ever since have come to be viewed as “authoritarian.” The goal after the 2006 coup was to rebalance democratic elections with non-elected institutions that would protect “minority” rights. Along the way the people’s mandate that might have been reflected in at least some of such majority decisions was somehow forgotten or overlooked. Many Thais, especially those who support the establishment and who have strong aversions to elected politicians, in particular those aligned with Thaksin, see the judiciary and the independent agencies as the counterbalance to the potential oppression of minority interest by elected representatives. So it has come to be that judges and members of independent agencies are seen, at least in theory, as “good” and “righteous” people, while politicians are expected to be “bad” and “corrupt.” This concept is not just a popular consensus that has naturally arisen out of disdain for politicians. It also has an intellectual origin in a former student activist-turned conservative thinker Mr. Theerayuth Boonmee. This notion has caught on among the Thai public which has come to expect the virtuous, judicious guardians of Thai “democracy” to protect and set limits against those with an election mandate. Why? Because the guardians appointed to office fall into the category of the “good people.” These virtuous guardians are mandated to watch the “bad people” and keep them in check. Such a concept of democracy guardianship rests on two premises: politicians are corrupt and cannot be trusted, and the electorate is ignorant, poorly educated, and easily manipulated by corrupt politicians. This dual justification underscores the belief that Thailand needs guardians to protect and provide guidance in its imperfect democratic system, because elected politicians are always up to no good. That is the question many Thais are starting to ask. While most people of any political stripes agree that most politicians cannot be trusted, and rightly so, but are the guardians of Thai democracy truly righteous and incorruptible? So it’s not just society that believes they are good, those who assume the role of guardians also have a high opinion of themselves. In fact, the Thai judiciary tends to see themselves as representing righteousness. Many judges see themselves as the King’s men (often they are men), who perform the duty on behalf of the monarch. His Majesty the King called for the courts to play the role of the arbiter of democracy when there was a question whether the April 2006 election in which Thaksin’s Thai Rak Thai (TRT) Party ran unopposed should be nullified (the Democrat Party boycotted the election). There was also a call for a royally appointed prime minister, which HM the King rejected. (The election was later nullified by the Constitutional Court and the TRT government was toppled by a coup d’état six months later in September 2006 for corruption, abuse of power and interference in the checks and balances system, among other things). Held in high esteem, members of the Thai judiciary and independent agencies are not subject to the rules of scrutiny applied to elected representatives. For example, unlike politicians they are not required to report their assets. But this may change as the current ruling Pheu Thai Party (TRT’s third reincarnation) is looking into changing rules to have members of independent agencies (and high-level civil servants) reveal their assets like politicians. Is it reasonable to apply the same rules to members of independent agencies, the so-called guardians? Should they be above scrutiny and accountability just because of their supposed goodness? Some examples of these guardians’ conduct may be helpful in answering these questions. Recently one of the nine Constitutional Court judges Mr. Boonsong Kulbupar was found to have hired his own son as his secretary on a 47,100 baht month salary and given him an 18-month paid leave to study abroad. The case was investigated by the National Anti-Corruption Commission or NACC, which found that the judge was acting beyond his authority as there are no regulations that provide for Constitutional Court judges’ secretaries to take paid leave to study abroad. The Constitutional Court judge’s action raised troubling issues, nonetheless the NACC found no wrongdoing on the judge’s part. According to the NACC, the judge’s act “caused no injuries or damages” to any given party, hence it could not be considered malfeasance. At the same time, the judge who’d caused no injury or damage was told to return all the salary (847,800 baht plus allowances) paid to his son. Contrast that outcome with a 2011 case in which a low-ranking policewoman was sentenced to 1,765 years jail for embezzling 504,932 baht from official traffic and gambling fines in 15 months during 2003-2004 (the court cut her sentence in half to 882.5 years because she confessed). After heavy criticisms another Constitutional Court judge came out to say that Judge Boonsong’s act was approved by the chief judge—contrary to the NACC’s finding that he acted without authority or approval. But that wasn’t the end of it, yet another Constitutional Court judge told the media “don’t lend too much credence to the NACC information” because Judge Boonsong’s son is still working at the Court (presumably he’s been back from studies abroad). There has been no follow up report as to whether the judge has returned his son’s salary or whether he is being punished in any way. The good guardians have been caught doing other naughty things such as giving themselves a raise—retroactively no less. The unlawful acts of self-compensation were committed by members of nearly all independent agencies during 2004 and 2005, several years before corruption charges were brought against them in court. Those who have been found guilty of revising their respective agency’s regulations on compensation to give themselves a 20,000 baht raise a month retroactively for several months include (former) members the Ombudsman (one of whom later became a Senate speaker), the Election Commission, the National Anti-Corruption Commission and the Constitutional Court. They were invariably told to return the money and given two years suspended jail sentence. What’s more, the guardians appointed to independent agencies have big salaries, which apparently go with fancy cars. Their official cars are generally Mercedes Benz and BMW that cost over three million baht each. Must the role of guardians be performed in such a luxury style and at the expense of taxpayers as the cost of appointing “good” people? In the big scheme of things, illegal raises and official fancy cars are small matters. Given the big legal and judicial issues of national importance these guardians have to work on, one might be able to overlook their minor transgressions if the major issues are properly dealt with. But sadly on major principles, they fall short too. Questionable actions such as the Constitutional Court judges stubbornly reading the word “and” in the Constitution as “or” or “and/or” in order to twist the law to allow interference against its own precedent, have inevitably raised questions about the Court’s credibility and integrity. Things like leaked videos revealing evidence of backroom dealings to save a favored political party (Democrat Party) from dissolution were damning, especially considering the Court had already dissolved the other major party (TRT) multiple times. Even worse was the dubious way the revelation was dealt with—shooting the messenger. Whatever was in the leaked videos was not investigated, but the blame was put on the video leaker instead. Impartiality? Ethics? Rule of law? And how should one take the Constitutional Court Chief Judge who one day admitted that the Court’s decision to dissolve the political party favored by the majority of people (People’s Power Party, the second reincarnation of TRT) and two other coalition parties in the government in December 2008 was political? He came clean that the decision was “not about interpreting the law” and it was made in a hasty and “half-baked” manner—decision first, facts later. It was by far the clearest admission that the Court puts politics over judicial integrity. The Court saw (and likely still sees) itself as “helping” the political situation but was it really being helpful? Should it have gone beyond its role to “help” in the political process in that manner? As many people have asked, on whose behalf and by what right did the Court make such a decision that in effect reversed the will of the people? Over the span of nearly a decade, the evidence suggests that the Thai Constitutional Court has been progressively politicized, from the asset concealment case of Thaksin Shinawatra in which he was dubiously let off the hook to what we have now, a highly politically active Court, so much so that it is difficult to rely on it to provide impartial justice to help resolve conflicts rather than adding more. It is also difficult to say whether Thailand has a case ofjudicialization of politics or politicization of the judiciary, or whether it is one and the same. Many of the guardians have a strong sense of entitlement. One outstanding example is Khunying Jaruvan Maintaka who refused to retire after the mandatory retirement age of 65. She believed she could serve until she was 70, and she was adamant that because she was royally appointed she could only be removed by a royal command. Other guardians were a little more coy, though, like appointed senators. Poll after poll shows the majority of Thais supporting a fully elected senate. The 2007 Constitution prohibits spouses, parents and children of sitting MPs from running for the upper house. This means most Thais don’t see the dangers of husband-and-wife parliamentas much as the guardians of Thai democracy do. (And one might also ask if appointed senators are less politically incestuous than the elected ones). The National Human Rights Commission (NHRC) issued a report three years after the 2010 violence that left over 90 dead and about 2,000 injured. The report blamed protesters for violating human rights and condoned the state using war weapons against its own people. It is no wonder that the report created controversy. Critics resoundingly slammed it as biased, lacking impartiality and principles (see for example, here, here, here, and here). The report made for a painful read for many. The Thai NHRC must be one of the very few national human rights bodies in the world that prioritize state authority and safety of public properties over human safety and the right to life. To state the obvious, the guardians of Thai democracy are only human—not godlings or any special breed of mortals with heightened righteousness implanted into their morality. As evident in their conduct, they are no different from other Thais, including Thai politicians, corrupt or otherwise. The members appointed to independent agencies or the Senate weren’t born in a bamboo shoot, or a cultural vacuum. Their mindset and worldview are the products of the Thai culture like everyone else, only they think they are better because they are given a special role to play as guardians. If one looks at the democratization progress in Thailand over the past ten years, one can see real changes in the socio-economic structure and the political landscape—in particular the rise of the new rural middle class that is demanding more economic and social participation. Seksan Prasertkul, a former student activist and a writer, described the rising Thai middle class in his recent well-received speech. The time for guided democracy has passed it expiration date. The history suggests no knights in shining armors are needed to save a democracy in distress. The guardians of Thai democracy need to rid themselves of the myth that they know better than the people or have an exclusive right to decide what’s good for the country. Decades on the fight for democracy is still ongoing. Thai society has grown with more diversity in beliefs and thoughts. But these are not necessarily bad, but a sign of a maturing society. Differences in opinions are normal in a free and open society. Respect for different opinions and for rules is important for peaceful co-existence. The demand for rights, equality, freedom and justice may be threatening for those who feel a change in the status quo will result in the loss of power and privilege. But the reality is that Thailand no longer has a large class of ignorant and subservient subjects but a new, modern, more informed electorate that is demanding participation in the political process. If Thailand chooses a parliamentary political system of government that gives the ultimate power to the people, it is then up to the people to decide the mandate of elected officials. Of course, minority voice must be respected but it is still the majority that decides. This is the most basic tenet of democracy that, however simple, many have failed to understand or choose not to abide by. This is not a uniquely Thai problem. Elsewhere, there are also similar standoffs between powerful minorities seeking to overturn elections, as seen in the American government shutdown. All the political players, whether elected or appointed, are far from perfect. There are no pure angels or demons on anyone side. All political classes, parties and factions have their own interests to pursue and protect. Democracy offers ways for different interest groups to negotiate but there are processes, which sometimes don’t work to everyone’s satisfaction. But that’s the nature of democracy. It is by design messy and slow. For it to work, those in power need to restrain themselves from taking short-cuts, which as the 2006 coup has demonstrated, have created more problems than solutions. It is a good sign that the Constitutional Court has allowed Parliament to do its work within the prescribed constitutional authority by rejecting the petitions on the government’s Senate change legislation and budget bill. However, it remains to be seen how the Court will rule on theremaining petitions, one of which charges that making the Senate fully elected amounts to an “overthrow of the democratic system” and if agreed by the Court could lead to a dissolution of Pheu Thai Party. It does not mean that by having the people’s mandate, the Pheu Thai government is always right (it has done many dubious things), but if it follows the rules it should be allowed to govern within its power and authority. And if it fails to honor the will of the people or break the people’s trust,* then the people will punish it in the next ballot box. Note: This article was first published on SiamVoices, Asian Correspondent on 20 October 2013. *For democracy to really work, the people need to keep doing their part after the election. Elected representatives need to be watched and reminded of their promises and duty to serve the people’s interests first and foremost, not their own. Pheu Thai has made a serious blunder with the amnesty bill and is deservedly taking the flak. I gave them one on my Facebook today.